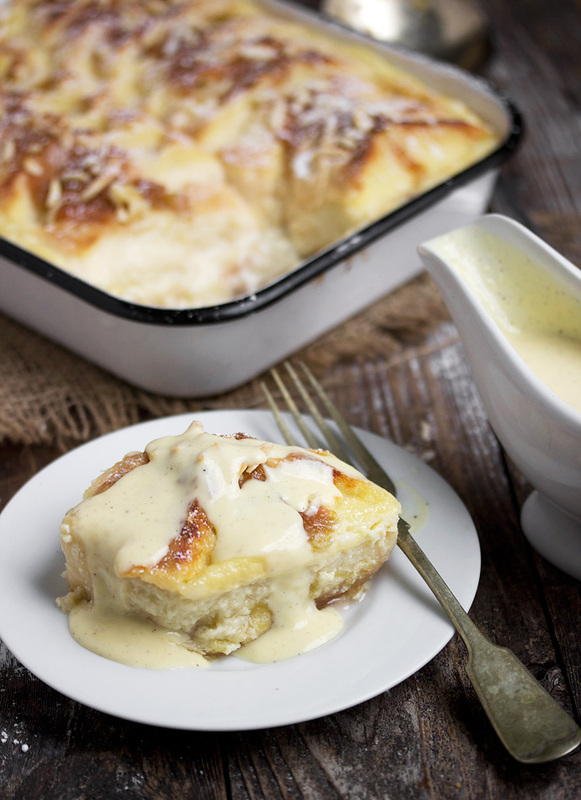 A delicious and easy Rhubarb Bread Pudding, all topped with a creme anglaise sauce custard sauce. 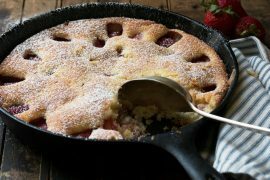 I know we’re almost out of rhubarb season and moving on to more summer fruits, but I thought I’d share this one last rhubarb recipe – perfect for those last few stalks from your garden or your frozen rhubarb! 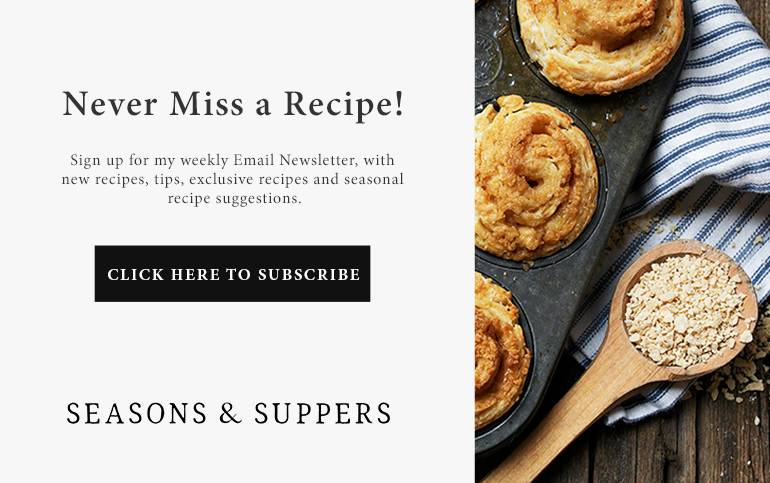 I think bread pudding is the ultimate comfort food and cooked rhubarb sauce is right up there in the comfort food department, too. So I thought I’d combine the two. 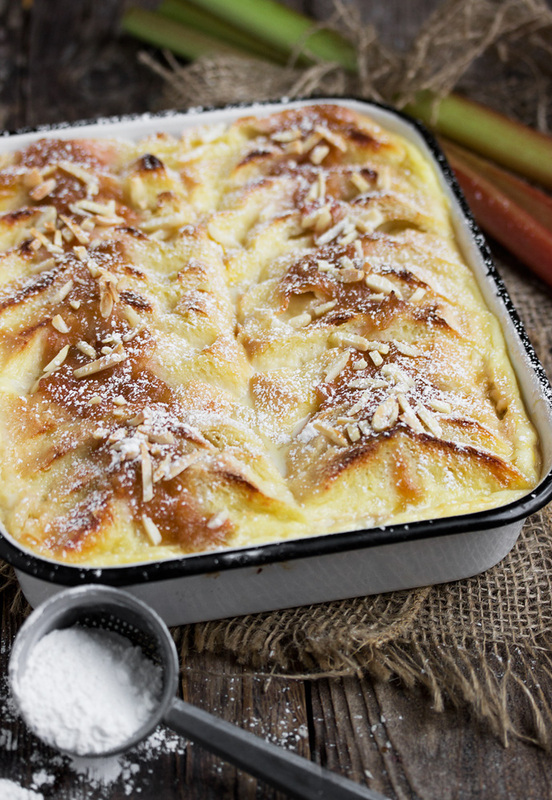 This pudding starts with a layer of cooked and sweetened& rhubarb on the bottom of the pan, followed by the bread that is lined up in neat rows. Pour over the egg/milk mixture, then a bit more of the stewed rhubarb is then spooned on top, along with some almonds. Of course, bread pudding is the go-to destination for slightly stale bread. If you only have fresh bread around, cut the slices and you can place them on a baking sheet in a 350 F. oven for a few minutes to dry them out a bit. For the rhubarb, you can cook it down just until just broken down a bit and leave it a little chunky, or allow to simmer down to a thick sauce. Either way it’s great. Just be sure your rhubarb is nice and soft. 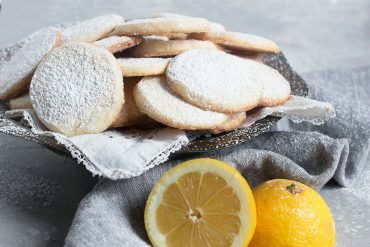 Do taste once it’s cooked down and add a bit more sugar if you find it too tart for your taste. I love to take the time to make a Creme Anglaise for bread pudding, but it’s really optional. The pudding is lovely without it (it’s just lovelier with it ;) You can make it ahead and keep it in the fridge for a hours. The rhubarb can also be cooked ahead and refrigerated. 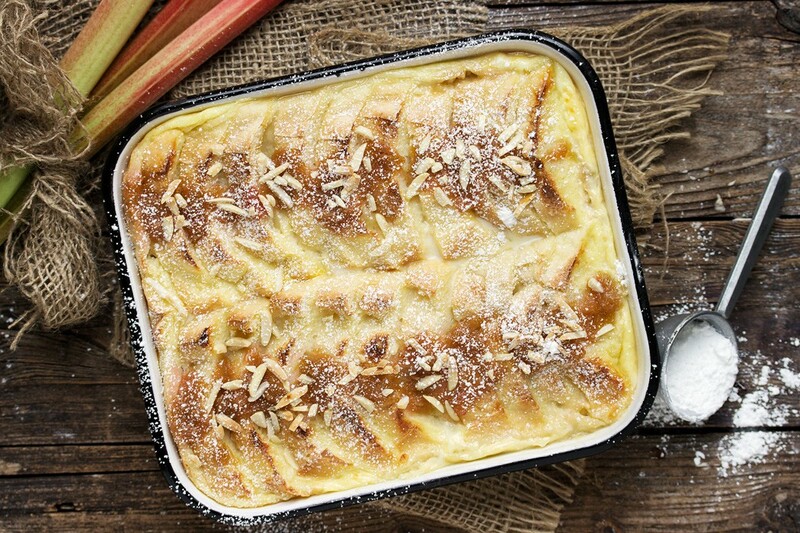 Classic comfort food bread pudding, meets stewed rhubarb. Perfect use for your frozen rhubarb, but you can also make this with fresh rhubarb. 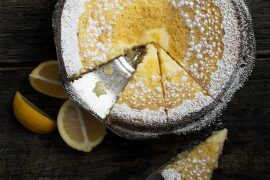 I love to serve this with a Creme Anglaise sauce (recipe below), but it's lovely without it as well. Be sure to start with slightly stale bread. If your bread is fresh, simply slice, place on a baking sheet and pop into a 350° F. oven for a few minutes to dry it out a bit. For the Creme Anglaise: Combine the milk, cream and vanilla in a heavy medium saucepan over medium heat. Bring milk mixture to simmer. Remove from heat. For the Stewed Rhubarb: Combine rhubarb, sugar and water in a large saucepan over medium heat. Stir well to combine and stir regularly until the sugar dissolves. Reduce heat to medium-low. Simmer until rhubarb is soft and thick. 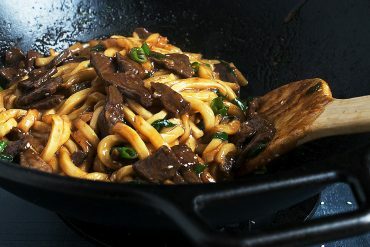 (*You can simmer less if you'd like a chunkier sauce or cook more for a less chunky sauce). Remove to a bowl to cool or make ahead and refrigerate until needed. For the Bread Pudding: Preheat oven to 350° Slice baguette into 1/2-3/4 inch slices and set aside. Meanwhile, in a bowl, combine the eggs, sugar, cream milk and vanilla. Whisk well to combine. Lightly grease and 8x8-inch baking pan. Spoon 2/3 of the stewed rhubarb into the bottom of the pan. Lay the sliced bread in two rows on top of the rhubarb. Pour the egg mixture over-top (it should all fit, but if not, let pudding stand 5 minutes, then add the rest). Sprinkle the exposed top of the bread with 1 Tbsp. 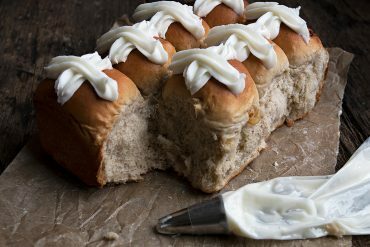 of white sugar, then spoon the remaining stewed rhubarb down the middle of each row of bread. Stop with sliced or slivered almonds, if using. 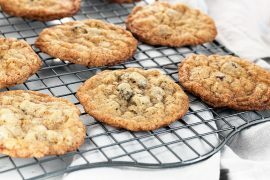 Place your baking pan on to a baking sheet (to catch any bubble-overand bake in the preheated oven for 40-45 minutes, or until set (I test with a knife. It should come out without any runny buts on it). Allow to cool slightly, then dust with icing sugar. Serve warm with some Creme Anglaise poured over-top. I have only made bread puddings with chunks of bread. 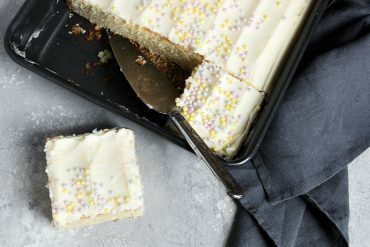 How big are the slices in this recipe? Hi Georgia, as detailed in the recipe instructions, the slices should be 1/2-3/4 inches. Hope that helps. I made this for a co-worker’s birthday and I have to say, it was fantastic! Jennifer, this is truly a masterpiece! Love absolutely everything about this bread pudding! Jennifer this bread pudding sounds amazing! It is one of my favorite comfort foods! My Mom loves rhubarb too, so this is on my list for when she comes to visit in a few weeks! What a delightful combination Jennifer! 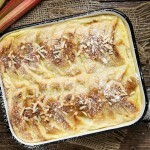 Bread pudding is one of my favorite desserts but I never thought to make it with rhubarb, yum! And the creme anglais sauce is the crème de la crème for sure! Jennifer – this is beautiful! I love the creme anglais sauce too! Such a perfect touch. I don’t know what it is about my area but it seems like we never got a good amount of rhubarb so I am totally envious. Great minds think alike, Sarah :) I was looking for something different to do with my rhubarb, too! You are an artist Jennifer – this is beautiful on so many levels. So rich and soft and I would love it! We still have some time before local summer produce kicks in here. I’m still seeing rhubarb at the store and love the idea of this recipe. I feel rhubarb gets the short end of the stick, almost always relegated to the traditional pie before summer hits. This elevates it so and gives it a whole new destiny! Thanks Toni and we are the same here. Local strawberries won’t show up here until mid-late June, so rhubarb is still the only fresh, local thing around. I have to confess I’ve never made a bread pudding, but you’ve tempted me with the rhubarb and that gorgeous sauce!! Bread pudding is absolutely the ultimate comfort food!! And this rhubarb version is calling my name. Girl, seriously, if you’re ever in Montreal we need to get together and just go wild making rhubarb treats! 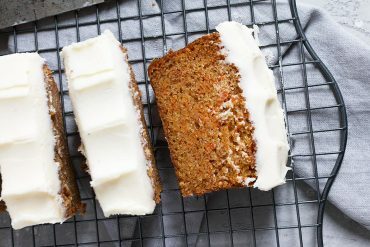 Pretty sure I’ve pinned every single one of your rhubarb creations! Thanks Katrina :) I have always loved rhubarb and the fact that it freezes so well means it’s an almost year-round treat for me!